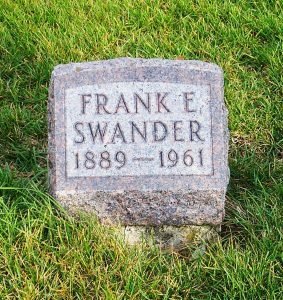 Franklin “Frank” Emil Swander was born in DeKalb County, Indiana, on 4 August 1889, the son of Emanuel and Frances (Strabie/Strabee) Swander. The Swander family lived on a farm 2 ½ miles north of Garrett, Indiana. This surname is spelled Swanders in many records. Frank and Laura had a son a year later, Glen Franklin, who died of a cerebral hemorrhage injury at birth or shortly thereafter on 26 November 1915. He was born in Fort Wayne, Indiana, and is buried at Lindenwood Cemetery there. This was the only child the couple had. In February of 1917 Frank suffered a serious injury while at work on the railroad. Newspaper accounts indicate that he had a lengthy hospital stay and he eventually lost his left leg. Frank married Edith (Haifley) Keller in DeKalb County on 11 March 1946. This was the second marriage for both and Edith was divorced. Frank operated a grocery store and Edith worked in a factory. They owned and operated the grocery store south of Auburn for years. Frank E. Swander, age 70, who operated the country grocery store at Hopewell for 27 years, died at 8:35 p.m. Sunday in the Dr. Bonnell M. Souder hospital in Auburn. Mr. Swander and his wife moved to Auburn 18 months ago after selling the country grocery seven miles south of Auburn. The late residence is at 320 West Eighteenth Street, Auburn. The body was removed to the Gerig Funeral Home in Auburn. Memorial services by the Loyal Order of the Moose of Auburn were conducted at the funeral home at 8 p.m. Tuesday. 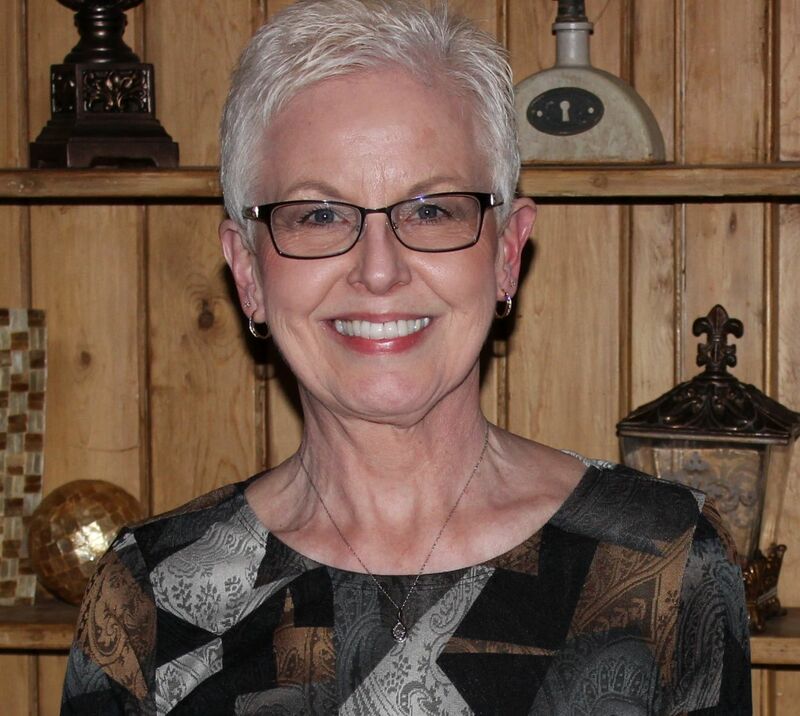 The body remained at the funeral home until it was removed at 11 a.m. Wednesday to the St. Mark’s Lutheran Church in Auburn to lie in state until final rites were conducted at 1 p.m. Wednesday. The Rev. George Schuette, pastor of St. Mark’s Church, officiated at the services with burial in the Lutheran cemetery at Chattanooga, O., 15 miles southwest of Van Wert, O.
Mr. Swander died following an illness extending over the past six years. He had been admitted to the hospital June 10. His death was attributed to a complication of diseases. A native of DeKalb County, he was born north of Garrett Aug. 4, 1890, son of the late Emanuel Swander and Frances Strebee Swander. His first wife preceded him in death. In a ceremony performed March 9, 1946, at Fort Wayne, he married Edith Haifley. She survives with two stepchildren, Harold Keller of Butler and Eloise Funk of Rt. 1, Grabill; two brothers, Clyde Swander of Rt. 1, Pleasant Lake, and Arthur Swander of Rt. 2, Wolcottville and three step-grand children. Neither Frank nor Laura is listed in Zion Chatt’s death and burial records. The only time the couple is mentioned in Zion Chatt’s records (besides Laura’s baptism and confirmation) is when Laura’s niece Lorina Irene Schott was baptized in 1920. Both Frank and Lora were her baptismal sponsors. “Ohio, County Marriages, 1789-2013,” database with images, FamilySearch, Frank E. Swanders & Laura Schott, 27 Jan 1914; Mercer County Marriages, Vol. 10, p.709; FHL microfilm 914959. Garrett Clipper, Garrett, Indiana, “George J Clark and John Cain Impersonated Officers?” 31 May 1917, p.8; Newspapers.com. 1900 U.S. Census, Richland, DeKalb, Indiana, ED 62, p.8A, dwelling 173, family 182, Emanuel M Swander; Ancestry.com; FHL microfilm 1240367, NARA microfilm T623, roll 367. 1910 U.S. Census, Richland, DeKalb, Indiana, Ed 82, p.13A, dwelling & family 267, Emanuel Swander; Ancestry.com; FHL microfilm 1374358, NARA microfilm T624, roll 345. Fort Wayne, Indiana, City Directory, 1914, p.1200, Frank Swanders; Ancestry.com; U.S. City Directories, 1822-1995. Indiana, Death Certificates, 1910-1919, Roll 2, no.821, Glen Franklin Swanders, 26 Nov 1915; Ancestry.com; Indiana State Board of Health, Death Certificates, 1900-2011, Indiana Archives and Records Administration, Indianapolis, Indiana. Fort Wayne Daily News, Fort Wayne, Indiana, “Pennsy Brakeman Injured,” 28 Feb 1917, p.7; Newspapers.com. World War I Draft Registration Cards, 1917-1918, Allen County, Indiana, Board 3, Frank E Swanders, 5 June 1917; Ancestry.com; WWI Selective Service System Draft Registration Cards, 1917-1918, NARA, Washington DC, M1509, roll 1503886. The Fort Wayne Journal Gazette, Fort Wayne, Indiana, “Rejected,“14 Aug 1917, p.5; Newspapers.com. 1920 U.S. Census, Swan, Noble, Indiana, ED 146, p.1B, dwelling & family 20, Frank Swanders; Ancestry.com; NARA microfilm T625, roll 459. 1930 U.S. Census, Fort Wayne, Allen, Indiana, ED 45, p.28A, dwelling 57, family 60, Frank E Swander; Ancestry.com; FHL microfilm 2340310, NARA microfilm T626, roll 575. 1940 U.S. Census, Jackson, DeKalb, Indiana, ED 17-8, p.11A, line 35, frank Swander; Ancestry.com; NARA microfilm T627, roll 1036. Indiana, Death Certificates, 1943, Roll 7, no.18142, Laura Swanders, 22 June 1943; Ancestry.com; Indiana State Board of Health, Death Certificates, 1900-2011, Indiana Archives and Records Administration, Indianapolis, Indiana. “Indiana Marriage, 1811-2007,” FamilySearch.org, Frank E and Edith L Keller, 11 Mar 1946; DeKalb County Marriages, Vol. 38 , p.511, FHL microfilm 1863340. Indiana, Death Certificates, 1899-2011, Year 1961, Roll 8, Frank E Swander, 18 Jun 1961; Ancestry.com; Indiana State Board of Health, Death Certificates, 1900-2011, Indiana Archives and Records Administration, Indianapolis, Indiana. 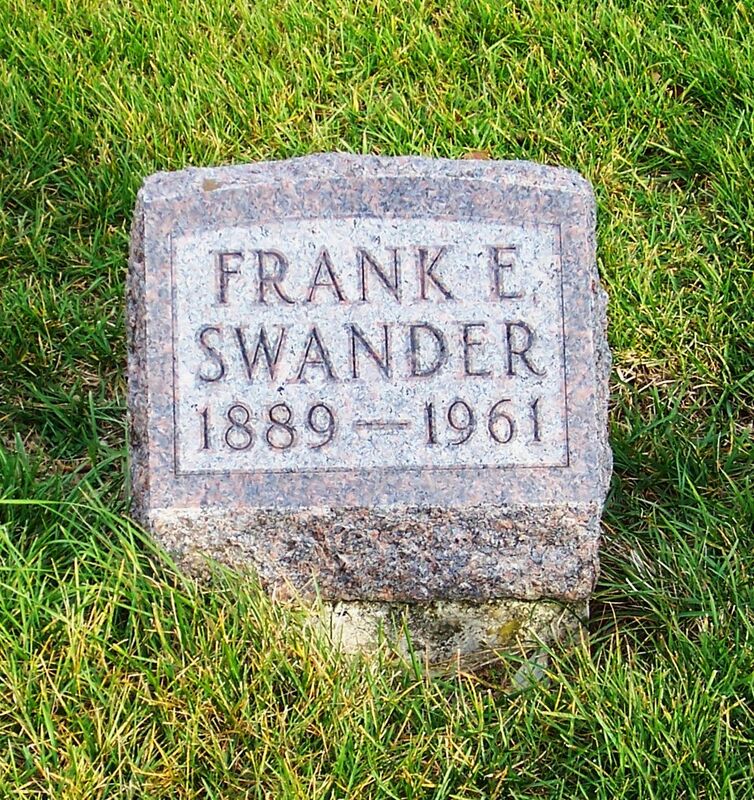 Garrett Clipper, Garrett, Indiana, “Frank Swander, Native of Near Garrett, Dies,” 22 Jun 1961, p.1; Newspapers.com. Indiana, Death Certificates, 1899-2011, Year 2003, Roll 3, Edith L Swander, 7 Feb 2003; Ancestry.com; Indiana State Board of Health, Death Certificates, 1900-2011, Indiana Archives and Records Administration, Indianapolis, Indiana.